After drifting 2.9 miles downriver, I died from dehydration on my first attempt to survive whatever the harsh wilderness threw at me in The Flame in the Flood: Complete Edition. The second wasn’t any better, in that I was gored to death by a wild boar as I rushed to take shelter from a storm in an abandoned school bus. This rogue-lite river journey can be wearying by design, but those with the tenacity to learn the intricacies of the many systems that are at play will soon relish the challenge that it presents. With yellow-eyed crows cawing against a somewhat disjointed melody played on a harmonica, the main menu masterfully transitions straight into the backwater adventure, where a stray dog, confused about its owner’s demise, carries a backpack to the player’s character, Scout, who is resting near a campfire. When you uncover a radio in the backpack, you soon abandon the long-derelict Camp Pinewood in an effort to hear the scrambled message that it plays more clearly – requiring that you move closer to the source, or reach higher ground. And so, your fight for survival begins. 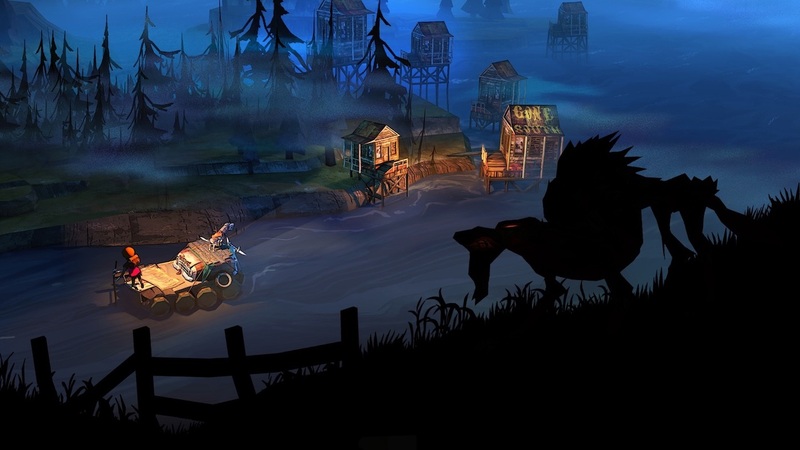 In talking about the game at its most basic level, The Flame in the Flood: Complete Edition will see players travelling down a procedurally-generated river on a raft, throwing a worn tyre to moor up at any location that you come across to collect supplies or take shelter whenever necessary. With multiple regions to survive in as your raft drifts onward, you must overcome the treacherous conditions that developer The Molasses Flood has laid before you. As you will soon discover, it is important to keep an eye on Scout’s general health – because if the wilderness doesn’t get you, a lack of awareness and preparation will. There’s hunger, thirst, rest, and the temperature to consider, each with their own on-screen gauge that continually dwindles. Encounters with wild animals can also lead to broken bones, ant bites, and laceration, which, as can be expected, are far trickier to deal with. Hunger can be more easily managed with munchable plants, berries, or using traps to hunt and cook rabbits, whereas thirst will require that the player use a jar to gather water from the rain, puddles, or even the river. But there is some danger in drinking any polluted water, meaning that it is important to purify it first – a process that requires that you craft a water filter, or hold out for any rain to save you the bother. Rest, too, is simple in that you can catch forty winks at any campfire or shelter to regain energy, although sleeping will increase your hunger and thirst overnight. However, rain can cause your clothes to become damp which lowers your body temperature in the process. Campfires can, therefore, help you to dry them, but the crafting system that underpins The Flame in the Flood: Complete Edition will let you make hardier outfits that will keep you protect you from the cold – although require that you hunt down and skin specific animals, as well as gathering other items. That leads me on to the bow, torch, tainted bait, and smoke jar, which are the four tools that players will want to craft as quickly as possible – helping you to fend for yourself in the wild. It won’t take long for your inventory to fill, pushing players to store things in their dog’s backpack or discard anything that doesn’t look like it will be of use. And in an unending twist to this rogue-lite, anything that your dog carries will be taken to Scout in your next playthrough. And, then there’s your raft. As you journey downriver you will float past buildings, cars, and trees, which all continue to represent the post-apocalyptic world in which you long to survive in. Accidentally slamming your raft into anything will damage it on impact if you can’t paddle hard away from it in time, with the chance to make repairs at any marina that you come across. Away from patching it up, resources that you collect can also be used to add a rudder, motor, or to make the raft sturdier, as well as throwing on a stove, tent, storage, or water purifier to, hopefully, ease your otherwise treacherous adventure. Those worried that they may never reach the conclusion to The Flame in the Flood: Complete Edition will appreciate the different difficulty options: Traveler is recommended for new players and has checkpoints that you can reload from as well as a normal abundance of supplies; and Survivalist, which is for more experienced players seeing as it has permadeath, fewer supplies, and Scout’s health deteriorates at an increased rate. Whichever choice you make, the journey will still remain to be a memorable one. Away from the main Campaign mode, there’s also an Endless Game. This removes the end goal, replacing it with the simple challenge of seeing how great a distance you can travel down the river. I preferred to have an objective to aim for, but this will be welcome for those that want to play without such a constraint. It is in the audiovisual design that The Flame in the Flood: Complete Edition excels, a soundtrack from alt-country rocker Chuck Ragan perfectly encapsulating the essence of this captivating game, which, in itself, has been built with such a wondrous art style. It’s great, then, that there’s a Director’s Commentary to listen to, giant cassette tapes placed in the world that the player can activate to hear short soundbites in which the team talk about how everything came together. With your canine companion patiently sat wagging its tail as you drift downstream, this uncharted journey through a forgotten post-societal America is one that will long linger in your mind. A tale of hardship and perseverance, The Flame in the Flood: Complete Edition succeeds in pushing you to your limits – standing out as memorable addition to the Nintendo eShop. And, you’ll be surprised at what you will discover along the way.